Dry mortar production line is mainly composed by the hoist, premixed warehouses, small silos, mortar mixers, finished products warehouse, packaging machines, dust collector, control system and gas balancing system. Our dry mix mortar manufacturing equipment adopts efficient horizontal dry mortar mixer, which does not destroy the original state of the material, and it can totally ensure the production quality of the final products. 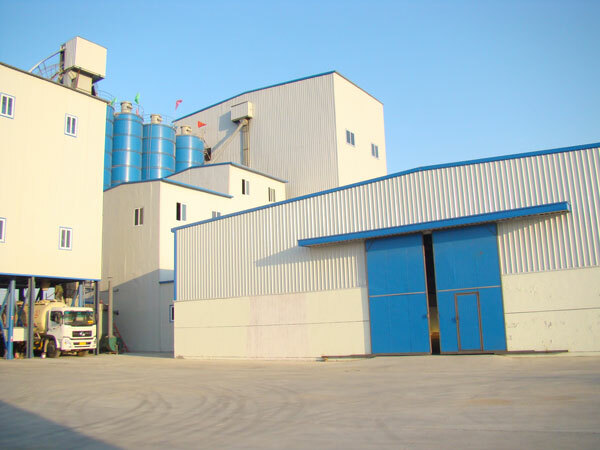 However, lots of users are unfamiliar with the working procedures of dry mix mortar plant china, and they have faced lots of difficulties in the actual production process. As a well-known dry mix mortar plant manufacturer in china, we want to share our operation experience to help them solve their troubles and difficulties. 1. Check all components of the device to keep it in normal operation condition, and add enough oil to the engine, mortar mixer, reducer and other parts to avoid the lack of oil in the production process. 2. Connect all the electric line, and users should empty run the machine carefully. Users should undergo daily operation after doing that. 3. Then, open the bucket elevators, air compressors and dust collector. Starting the batching machine, and the material to be mixed should be lifted to the warehouse. 4. Starting the horizontal mortar mixer, and the final product can be lifted to the finished product warehouse efficiently through screw conveyor. Contact us at anytime to get a free quotation! © 2019 Aimix Group Co., Ltd. All Rights Reserved.